TLDR: 3 out of 5 for a book with interesting ideas, but some flaws. This is one of ACC's earliest novels, built from a 1948 novella called Against the Fall of Night. "Like a glowing jewel, the city lay upon the breast of the desert." The City and the Stars is set a billion years in the future. The planet earth has long since become a desert wasteland, and humans (such as they are) now reside in a single, perfect, enclosed, and unchanging city named Diaspar. Gone and forgotten are such things as sexual reproduction, nuclear families, and scarcity. For the last many millions of years, the computer has instantly created all that's needed in the city. Humans are no longer born, but recreated by the computer, which stores the personalities of all people in a vast databank. When a new person is reborn, they are raised by a pair of guardians who volunteer to care for the child, and a tutor who is responsible for education. When that child reaches maturity, their old memories are gradually restored. People live this way for hundred of years at a time, then may pass several thousand in storage before being reborn again. This system has been maintained in a stable fashion for millions of years. Diaspar itself is shut off from everything outside - even the desert planet earth on which it sits. It's possible to look out on the planet and the stars from certain places in the city, but most people don't - indeed, they have a built in fear of doing so. According to their history, humans long ago lost a galactic war and were allowed to maintain their existence on the planet earth provided they never ventured into the stars again. Enter Alvin, a young man who actually is curious about what lies outside the city. He struggles against a society which can't related to him, and wonders why he is different. The answer, it turns out, is that Alvin is a unique person, who has never been born before. How has his birth come about? Only the computer knows. The City and the Stars follows the adventures of Alvin as he learns about the nature of the city, what lies outside of it, and the concealed past of Diaspar. He's helped along the way by a couple of intriguing characters, including his tutor Jeserac, and the jester Khedron, a sort of sand-in-the-oyster type character introduced into the Diaspar system by the computer or the creator of Diaspar. This is all very promising until about halfway into the book, when the plot takes an odd right turn and goes in a different direction. Alvin and Khedron, who have the most potential to be interesting characters because they're agents of change, cease to be that and the book starts to be more about... Arthur C. Clarke, I guess, who appears to have written the story while on a 6-month ocean-liner journey of his own from London to Australia. For much of the second half of the book, Alvin becomes and observer of the change he;s set in motion, and Khedron has all but disappeared from the novel. Conceptually, I find this book really intriguing. I think there's a lot of scope for intrigue and high-concept play within the city of Diaspar and it's immediate surrounds. 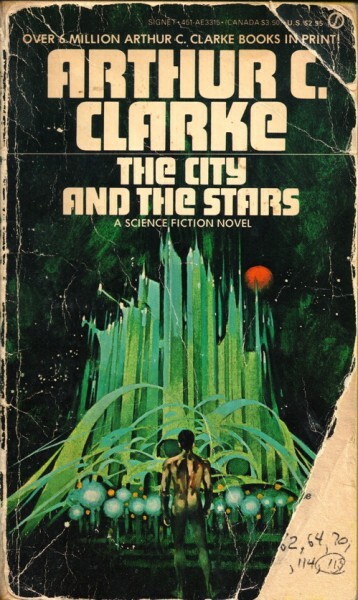 Had Clarke stuck with this and developed some of the characters and situations he created earlier in the story (Khedron's fears of mysterious interlopers in the city, for example, or played Khedron's need to create disruption against his own built-in fears of change, and that against Alvin's drive) this would have been a cracking novel. Sadly, though, it is let down a little by too broad a focus, and Clarke struggles as always with characters. As a story, it falls down, and this makes it difficult to recommend, though I do consider it to be worth reading. Perhaps it is best taken as an artifact of SF history, as a concept book of the far future. You can certainly mine it for ideas, and if your'e someone who likes to write, I think you'll find that Clarke left a lot of untapped potential here on the table for you to take further.